It has become our tradition to attend the first performance of a show after the Tonys. The first show I did this for was Sweeney Todd. Inexplicably, Sweeney didn't win, nor did any of its nominated leads, but it was thrilling to be there. It was obvious that fans of the show and cast were there to show love and support, win or lose. The house was loud with appreciation! Two years ago, we went to Grey Gardens. What a thrill it was to be there to see new Tony winners Christine Ebersole and Mary Louise Wilson, who won Best Leading Actress and Best Supporting Actress respectively. Last year, we took a chance that Gypsy would be the show to see on that first Tuesday. Patti LuPone, Boyd Gains and Laura Benanti didn't disappoint - they brought home the Tonys and brought down the house. This year, Noah, Kevin, Roxie and I are taking in the first post-Tony performance of Blithe Spirit. 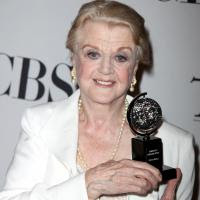 There's a reason why Angela Lansbury won the Tony for Best Supporting Actress in a Play and I know she'll prove it again tonight. No doubt the cheering will be reverberating out into Shubert Alley for this 5-Time Tony Winner!